Beginning in about two weeks, the State of Maine will be launching an advertising campaign called “Shop, Dine and Stay” to promote specials and packages throughout Maine for the November-December season. 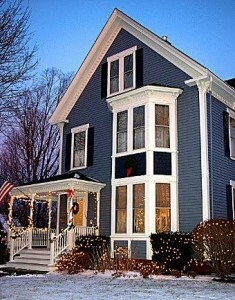 Joining in the spirit, Brewster House Bed & Breakfast is pleased to announce our new Shop, Dine & Stay package. Our package includes two consecutive nights at Brewster House in Freeport, Maine, a $100 gift card to L.L. Bean (valid at any of its 5 Freeport stores, its other stores, online or by mail order), and a $50 gift certificate so you can dine at Azure Cafe. The package is available November 5 – December 19, 2009. The all-inclusive rate of $499 is for queen rooms, double occupancy (rates for other rooms are also available). Add a third consecutive night for only $100. If you’re starting to think about Sparkle weekend, or planning your Christmas shopping, Shop, Dine and Stay at Brewster House!